1984 Diplomarbeit "Trainierbarkeit der Balancefähigkeit von Leistungsturnern und Normalpersonen (posturographische Meßungen)"
Strain differences in profiles of dopaminergic neurotransmission in the prefrontal cortex of the BALB/C vs. C57BL/6 mice. Consequences of stress and afobazole. Eur J Pharmacol 2013 May 15; 708(1-3): 95-104.doi:10.1016-7j.ejphar.2013.03.015.Epub2013Mar21. Erythropoietin neuroprotection is enhanced by direct cortical application following subdural blood evacuation in a rat model of acute subdural hematoma. 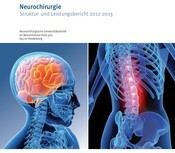 Neuroscience (2013) Feb 13. Doi:pii: S0306-4522 (00111-5.10.1016/j.neuroscience.201301.067. Epub ahead of print. Blood constituents trigger brain swelling, tissue death and reduction of glucose metabolism early after acute subdural hematoma in rats. Two centre study with correlation of clinical findings with a comprehensive craniofacial classification system. Increased water temperature renders single housed C57/BL/6J mice susceptible to antidepressant treatment in the forced swim test.